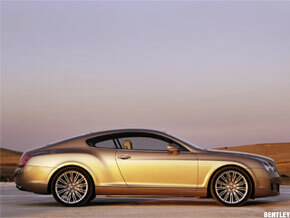 The 2011 Bentley Continental GT takes biofuel, but keeps up with a surging luxury car market. CREWE, England (TheStreet) -- With luxury auto sales roaring to life, even Bentley can afford to get environmentally conscious. The 2011 Continental GT introduced today may be the most eco-conscious model Bentley has produced in recent history, but for an imprint once sandwiched between falling $100 bills and bottles of Cristal in P. Diddy videos, eco-conscious is a relative term. After taking a year off, the nearly $200,000 Continental GT returns stateside with an optional 4.0-liter V8 engine that seems like a battleship compared with a Toyota ( T Prius, but is somewhat more svelte compared with the marque's standard 567-horsepower W12, which gets a gaudy 12 miles per gallon in the city and 19 on the highway. Still, that's better than the 2009 model that was 15-horsepower less potent, two miles per gallon less efficient and, according to Bentley, produced 40% more emissions. A car that tops out at 198 miles per hour has a hard time taking baby steps toward anything, but the Continental GT's new flex-fuel engine -- it can run on E85 ethanol -- inches toward ecological respectability while maintaining the bulk, brawn and baubles consistent with the brand. The Continental GT parallels the improving fortunes of the luxury auto industry and Bentley's own resurgence and improved position within the Volkswagen AG portfolio, which includes Volkswagen, Bentley, Lamborghini and Bugatti. Several luxury automakers reported year-over-year increases in sales in August, with Volkswagen sales up 21%, Audi sales up 14%, Mercedes-Benz up 15% and Porsche climbing 33%. Bentley sales, meanwhile, were up 11% for the first half of the year, with revenue increasing more than 34%, pushing a 20% overall increase for Volkswagen AG. As a result, Bentley can play around with its miles per gallon without stripping away such sought-after amenities as soft-covered "Cobra" seats with expanded legroom and built-in massagers, jeweled headlights lined with LED daytime running lights, leather-lined door storage bins with bottle holders and an eight-inch touchscreen interface with Google Maps, digital television, a 15-gigabyte hard drive, SD card reader, an eight-speaker sound system and Apple iPod controls. Combined with the brand's pledge to have its whole line consume 40% less fuel and be completely biofuel-compatible within two years, Bentley's Continental GT brings style and sensitivity to the latest luxury resurgence. --Written by Jason Notte in Boston.